Reference number for this case: 22-sep-54-Paris. Thank you for including this reference number in any correspondence with me regarding this case. After the astonishing observations which excited and intrigued last week, more than a thousand Rome residents, in the course of the last forty-eight hours, many Frenchmen, in various regions, witnessed these phenomena in their turn. It is confirmed once more (and this is the essence of this great mystery) that the reports match as to the strange evolutions of these unknown devices. Once again, too, the thesis of hallucination is hardly admissible. General perplexity is a fact on which everyone agrees, while "saucers" and "antisaucerists" will find there an exciting and inexhaustible conversation topic. "I'm sure it was not the lights of the Eiffel tower or the lights of an airplane, for I saw the craft going up vertically. An old gentleman, who was near me, and who had also noticed the phenomenon, ran away. Her friends gently teased her by reminding her that she had played the part of Joan of Arc. But the star persisted in confirming what she had seen. Until now, flying saucers had never been seen in the Seine-et-Marne. Everything happens, since, on Wednesday, around 8:30 p.m, two residents of Saint-Fargeau witnessed the moves of a ball of fire. These persons are worthy of faith, it is the appariteur Mr. Binet, and Mr. Ravot, butcher. The latter was returning from Ponthierry when he saw through the windscreen of his car, just before him, a ball of fire moving in the sky. "I was so surprised," he said, "that I stopped my car, I went out and followed the machine with my eyes for a few minutes. It moved horizontally, sometimes to the right, sometimes to the left, then disappearing in the clouds. It appeared four times, and I noticed in its back a small trail of light, not very long." Back home, Mr. Ravot could not resist the desire of calling his neighbor, Mr. Binet. The two men inspected the sky, but in vain. Suddenly the butcher's little girl uttered an exclamation. The ball of fire had made a new appearance. Mrrs. Binet and Ravot saw it clearly. It paused for a few seconds before disappearing into the clouds. Let us repeat this testimony of one of our readers, Mrs. Gamundi, living on 192 avenue Jean Jaurès, Paris. The day before yesterday, she was driving by car between Fontainebleau and Essonne, and for half an hour she watched a motionless luminous ball surrounded by a kind of smoke, from which other luminous balls were falling. The ball shifted suddenly and rose at high speed. [...] cigar shape surrounded by a kind of purple blue steam. - Another cigar, matching the characteristics of the one observed in Rome, was seen by three people from Lodève (the Herault). The craft seemed to tow a shining globe at a speed of 1,500 km per hour. As of Dr. Mercier, of Le Puy, he declared that he had observed, twice above the town, a silent round, brilliant object, which moved from south to north at a very high altitude. This machine would also have been seen by several farmers around Le Puy. - In the Puy-de-Dôme, new witnesses of the phenomenon became known. The craft had a red color. It was a very elongated cigar which, and this is the first time that this particularity is reported, flew sideways. It was absolutely clear, without trail, and seemed to fly very high. The other night, around 11 p.m., three young boys aged 16 to 17, who were walking on the jetty of the harbor of Banyuls-sur-Mer (PO), saw in the sky an oblong object moving at high speed and from which seemed to come out red and green flames. A little frightened, the boys went to tell their story to various consumers who were on the terrace of a coffee shop, but thee latter watched the sky and saw no trace of the mysterious machine. (2) If these "saucers" or "cigars" could not be hunted for better observation so that the public would know exactly if come collective autosuggestion has to be dissipated or whether it is necessary to consider these phenomena to the point of view of security and national defense. Paris, September 24. Before yesterday evening at 7:40 p.m., Michèle Morgan returned home, at the Invalides, completely distraught, her big eyes out of her head. "- I saw, on the Esplanade, in the sky, two luminous globes, the largest one looked like a big star. And I'm sure it was not the lights of the Eiffel Tower, or those of an airplane, because I saw it suddenly rise vertically." "An old man, who was near me, and who had also noticed the phenomenon, ran away like a young champion." "When I got home, I immediately phoned my husband to tell him of my extraordinary emotion. He listened with skepticism. Nevertheless, I am sure I was not the victim of an hallucination. " Although she incarnated Joan of Arc, Michèle Morgan does not want people say she had visions. The article underneath has been published in the daily newspaper The Newark Star-Ledger, New York, USA, on September 24, 1954. L'article ci-dessous est paru dans le quotidien The Newark Star-Ledger, New York, USA, le 24 septembre 1954. To be anybody at all in France these days you practically have to have seen a flying saucer, preferably one of the iridescent ones that change color like a juke box. Being able to down gallons of champagne, or owning a slightly rundown château or even attending an opening at a theater hardly counts. Flying saucers, and now flying cigars, are "sighted" practically daily by witnesses who are upstanding citizens, model of probity and sobriety and pillars of the community. Latest to report the phenomena was movie star Michèle Morgan who said she sighted a luminous disc hovering over the dome of Les Invalides, where Napoleon is buried. "An old man near me also saw it," Miss Morgan said. "But he ran away." 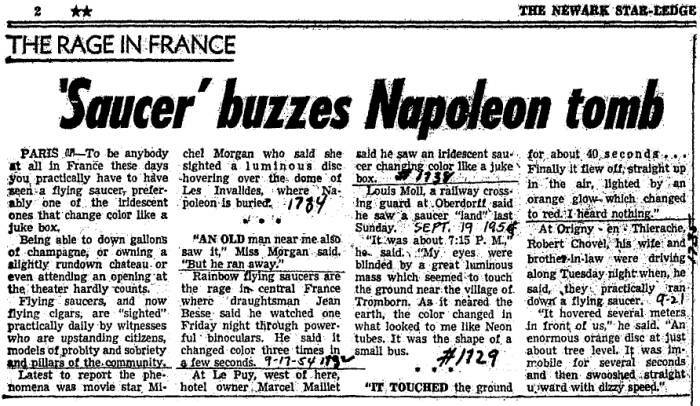 Rainbow flying saucers are the rage in central France where draughtsman Jean Besse said he watched one Friday night through powerful binoculars. He said it changed color three times in a few seconds. At Le Puy, west of here, hotel owner Marcel Maillet said he saw an iridescent saucer changing color like a juke box. Louis Moll, a railway crossing guard at Oberdorff said he saw a saucer "land" last Sunday. "It was about 7:15 P.M.," he said. "My eyes were blinded by a great luminous mass which seemed to touch the ground near the village of Tromborn. As it neared the earth, the color changed in what looked to me like Neon tubes. It was the shape of a small bus. Finally it flew off, straight up in the air, lighted by an orange glow which changed to red. I heard nothing." At Origny - en Tierache, Robert Chovet, his wife and brother-in-law were driving along tuesday night when, he said, they practically ran down a flying saucer. "It hovered several meters in front of us," he said. "An enormous orange disc at just about tree level. It was immobile for several seconds and then awooshed straight upward with dizzy speed." The underlined parts are not underlined in the original article, they indicate the parts of the article relevant to this case. AND NOW THE "FLYING BUS"
PARIS, Friday. 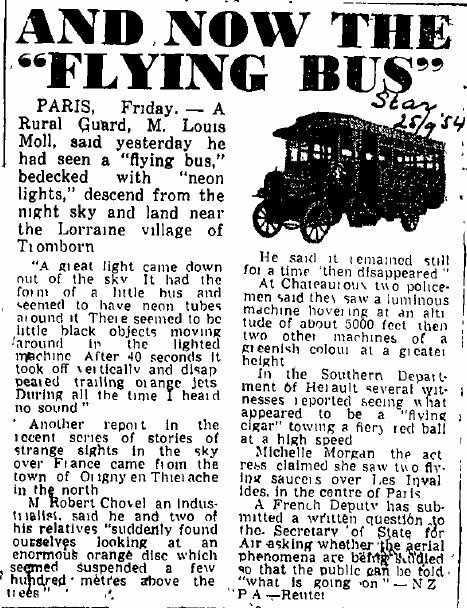 -- A Rural Guard, M. Louis Moll, said yesterday he had seen a "flying bus" bedecked with "neon lights" descend from the night sky and land near the Lorraine village of Tromborn. "A great light came down out of the sky. It had the form of a little bus and seemed to have neon tubes around it. There seemed to be little black objects moving around in the lighted machine. After 40 seconds it took off vertically and disappeared trailing orange jets. During all the time I heard no sound." Another report in the recent series of stories of strange sights in the sky over France came from the town of Origny en Thierache in the north. M. Robert Chovel, an industrialist, said he and two of his relatives "suddenly found ourselves looking at an enormous orange disc which seemed suspended a few hundred mètres above the trees." He said it remained still for a time "then disappeared." At Chateauroux two policemen said they saw a luminous machine hovering at an altitude of about 5000 feet then two other machines of a greenish color at a greater height. In the Southern Department of Herault several witnesses reported seeing what appeared to be a "flying cigar" towing a fiery red ball at a high speed. Michelle Morgan the actress claimed she saw two flying saucers over Les Invalides, in the centre or Paris. A French Deputy has submitted a written question to the Secretary of State for Air asking whether the aerial phenomena are being studied so that the public can be told "what is going on". -- N.Z. P.A. - Reuter. At Paris itself, the famous movie star Michèle Morgan, walking on the esplanade of the Invalides Tuesday night, reported seeing two strange luminous globes in the dark sky above the Eiffel Tower. Their weird appearance scared an old gentlemean, who was also looking at the sky, into precipitated fleeing. [Ref. us1:] NEWSCLIPPING BY THE U.S. AIR FORCE:"
Project Blue Book of the US Air Force amongst other activities of investigation of UFO reports, used a newsclipping service to gather all newspaper articles referring to the phenomenon. The transcription of September 1954 below comes from it, and to any probability is an extract of a longer newspaper article, of which precise references are for once missing once in the U.S. Air Force the files (accessible at the NARA in Washington). [...] Michèle Morgan, will contribute nothing to overcoming this timidity. The other night, about 7:15 PM, returning home near the Invalides, she clearly observed one of these celestial vehicles that have been so strangely multiplying recently. Unfortunately she told people about it. The press echoed it. After that, she was assailed by telephone calls day and night. "Jokers" asked her if she started having visions when she played Joan of Arc. Finally she had to have her telephone disconnected. You won't get her to testify in the interests of science the next time. It might be added that the terms "saucer", "cigar" etc., hardly contribute to the serious treatment of these disconcerting manifestations. "Saucer" has a café odour about it, and cigar evoques a postprandial beatitude. The imprudent words create an "atmosphere" scarcely propitious to scientific rigour. The author indicates that in the first week of October 1954, over the Invalides airport [sic], in Paris, the actress Michele Morgan saw a glowing disc. Aimé Michel reports that on September 22, 1954, in the evening, pedestrians who were on the esplanade of the Invalides in the center of Paris saw two small luminous balls coming and then disappear in the clouds. Michel notes that the very popular movie actress Michèle Morgan was among the witnesses. He adds: "Newspapermen and comedians made fun of it when she told of her observation, the following day, advising her rather coarsely not to play in the real life the character of Jeanne d'Arc, famous for her visions, which she came to play on the movie screens with her recognized talent." Michel specifies that in spite of the mocking of the press, Michèle Morgan persisted in stating that she really very well observed two luminous balls to arrive successively at sharp pace and go up vertically to the clouds to disappear there. The actress also reported an interesting aspect of the interesting, from a psychological point of view. "An elderly man who was crossed the esplanade not far from me also noticed the phenomenon. He contemplated it with the same amazement, then looked at me, understood that I had surprised his curiosity, made a guilty face and fled in great haste, obviously for fear that that I would ask him to confirm such an absurd display." Ufologist Harold T. Wilkins wrote that over Les Invalides airport [sic] in Paris, actress Michele Morgan saw a glowing disk. The two authors indicate that in Paris on September 22, 1954, at 08:30 p.m., two small balls at high altitude was observed. They say that one can seriously think that it was large a meteorite since the description is "identical" to a case in Dôle the same day in which the witness had told them to have seen at 08:30 p.m. a fast fugitive gleam which crossed the sky. Michele Morgan tells her observation of the day before, and is the target of mockeries of journalists and songwriters. Luc Chastan indicates that in Paris on September 22, 1954, "Esplanade des invalides, around 19 hour 30, actress Michele Morgan sees two luminous balls arriving one after the other at sharp pace and going up vertically in the clouds to disappear there. Another person seems to have seen the phenomenon at the same moment." The website indicates that on 22 September 1954 at 20:30 in "Paris, Champ.Mars", France, "Hovered." And: "A hovering object was observed. One luminous disc, about 10 feet across, was observed by one male witness for a few seconds (Morgan; Raffoux)." 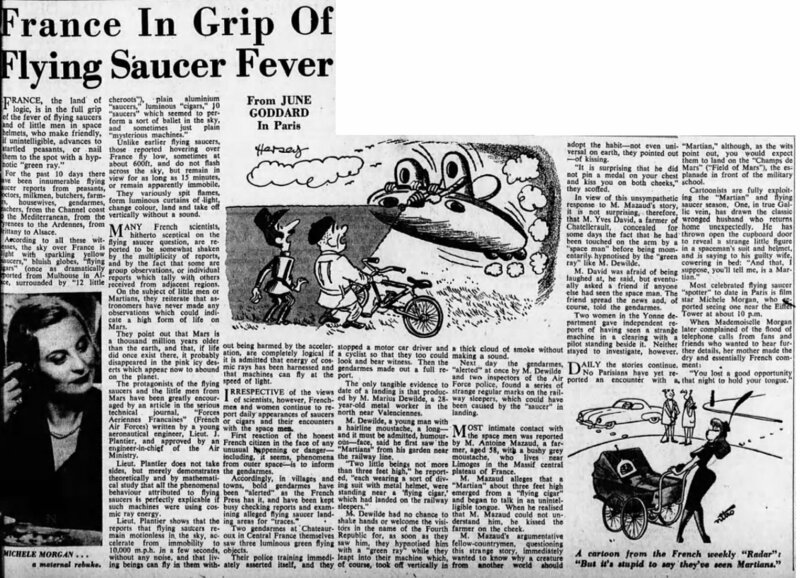 The sources are indicated as Michel, Aime, Flying Saucers and the Straight-Line Mystery, S. G. Phillips, New York, 1958; Vallee, Jacques, Computerized Catalog (N = 3073); Vallee, Jacques, Anatomy of a Phenomenon, Henry Regnery, Chicago, 1965; Newspaper Clippings. Famous actress Michèle Morgan and another witness Mrs Poulard together on picture in a newspaper article of that time on the 1954 flying saucers. [pl1] Article in the national newspaper Le Parisien Libéré, Paris, France, September 24, 1954. [sl1] Article in the national newspaper The Newark Star-Ledger, New York, USA, September 24, 1954. [ts1] Article in the foreign newspaper The Star, Auckland, New Zealand, September 25, 1954. [---] Article in the regional newspaper La Liberté, Clermont-Ferrand, France, September 27, 1954. [jd1] Article in the national weekly newspaper Le Journal du Dimanche, Paris, France, September 26, 1954. [us1] Newsclipping, archives, Projet Blue Book, US Air Force, September 1954. [am1] "Mystérieuses Soucoupes Volantes", book by Aimé Michel, Seghers publisher, France, page 98, 1958. [hw1] "Flying Saucers Uncensored", book by Harold T. Wilkins, Pyramid Books publishers, USA, pp 56-57, 1967. [bb1] "La Grande Peur Martienne", book by Gerard Barthel and Jacques Brucker, Les Nouvelles Editions Rationalistes publishers, France, page 172, 1979. [jt1] "UFO Roundup", electronic UFO bulletin by Joseph Trainor, Volume 2, #38, October 5, 1997, www.ufoinfo.com/roundup/v02/rnd02_38.shtml. 0.1 Patrick Gross November 8, 2006 First published. 1.0 Patrick Gross January 17, 2010 Conversion from HTML to XHTML Strict. First formal version. Additions [jb1], [lc1], [ud1]. 1.1 Patrick Gross March 7, 2010 Addition [jt1]. 1.2 Patrick Gross October 10, 2016 Addition [fa1]. 1.3 Patrick Gross December 5, 2016 Additions [pl1], [ub1]. 1.4 Patrick Gross February 25, 2017 Addition [ts1]. This page was last updated on September 15, 2017.